I have been avoiding writing about this for months. Maybe if I didn’t write it down, it wouldn’t be true. Ah, we humans are such fools. 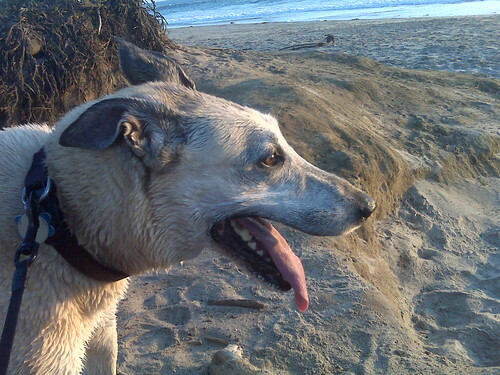 This is a couple years ago, after an epic beach run. She has taken her last beach run. Her back legs have gotten so weak that she uses a ramp to get up into the car. One of her legs collapses without warning. Yesterday on the kitchen floor, all of her legs slid out to the sides and she lay sprawled and helpless until I lifted her up. It is busting my heart up into little pieces. I look at her so often with tears in my eyes now. I don’t know how much longer I’ll have her, but I think it will be measured in months, not years. Maybe a year. It stinks for me, because she is my girl, but it especially hurts me to think of my mom. Mom swore, when her dog Poncho died, that she would never get another. She said “It’s like losing a child” (which she has also done, twice, so don’t tell me she can’t compare). Then I introduced Goldie into her life. Now they’re best friends and spend every day together. I don’t know how mom will survive this one. Dogs deserve better. Why don’t they get 50 years instead of 12 to 20? I’d gladly give her some of mine. Updated to add: Thanks for all your kind comments. Of course, as soon as I hit publish, she began dancing around like a puppy and wanting me to throw her toy for her (for the first time in about a year). Of course. Silly dogs. Oh, Sue, I’m so sorry. I know just how painful this is and I wish there were some way to make it easier for you. Much love to you and to Goldie. She seesaws between awesome and gimpy. I’m just trying to enjoy every moment. I know I’ve never met your Goldie. But I feel like I know her from hearing your stories over the years, as well as from all of the photos. She’s so beautiful with that great big smile, Suebob.